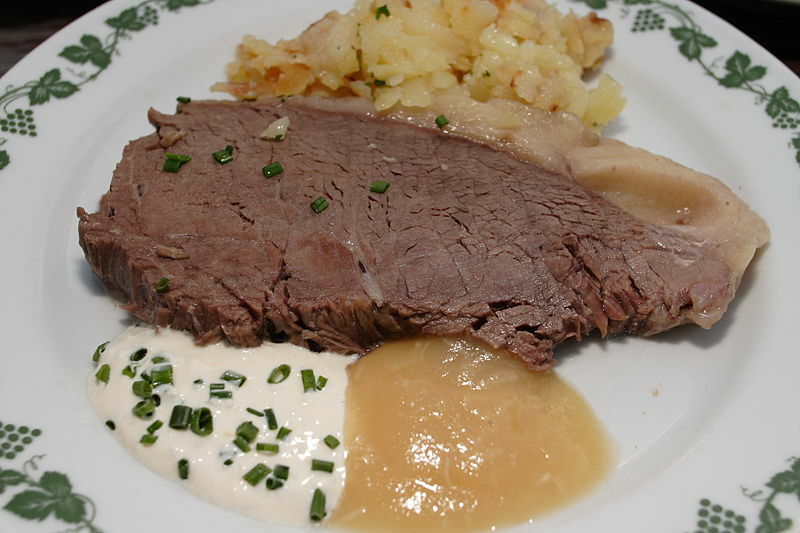 Tafelspitz (German Tafelspitz, literally meaning "tip of meat for the table") is boiled beef in broth Viennese style. Tafelspitz is the name of the meat cut which is used, usually from a young ox. The meat for Tafelspitz is well-aged pieces of beef, a cut of beef from the bottom sirloin primal cut (tri-tip). Alternatively, a similar cut of beef from a young ox, properly hung, with firm white fat (not yellow). The fat can be left on to prevent the meat from becoming dry. It is a typical Austrian dish. The beef is simmered along with root vegetables and spices in the broth. It is usually served with roasted slices of potato and a mix of minced apples and horseradish or sour cream mixed with horseradish. Tafelspitz is considered to be the national dish of Austria.